Thanks to Kyra Kverno and Nikki Vee for the photos. Click on any photo for a larger image. It was raining on Friday morning, and it looked like the first day of the Newport Jazz Festival was going to be a wet, soggy affair. But by the time I arrived at Fort Adams, the rain clouds had cleared, and the weekend-long event was in full swing. The first rule of multi-stage, multi-day festival-going, at least as far as I’m concerned, is that you can’t see or hear everything, and trying to do so is a recipe for disaster. So you map out your weekend beforehand, hoping to stick with the schedule. Something unexpected always intervenes, but it’s often a delightfully unexpected surprise. In recent years the Newport Jazz Festival, celebrating its 62nd anniversary this year, has been able to add a third day to the traditional Saturday and Sunday lineup. Friday now features, although by no means exclusively, new and emerging artists, and as a result is often the festival’s most intriguing day. 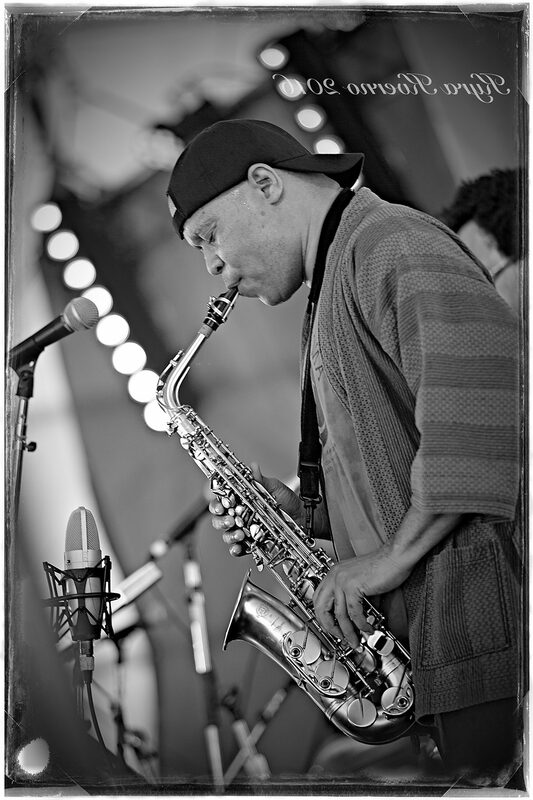 Steve Coleman. Photo by Kyra Kverno. First up on Friday were Steve Coleman and the Five Elements, who played on the festival’s middle, or Quad stage. It was wonderful to see the veteran Coleman mentoring these young musicians who didn’t look like they totaled 100 years between them. 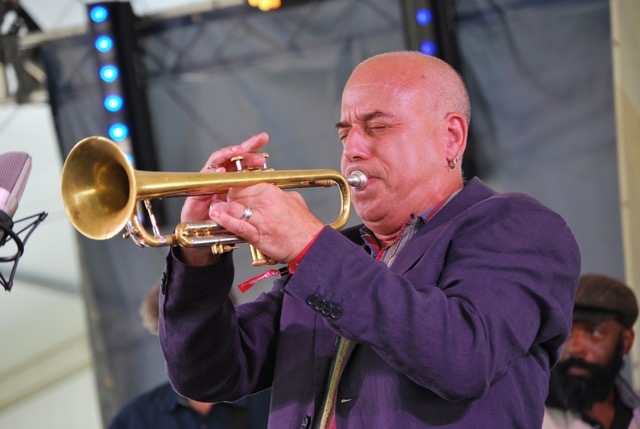 In addition to Coleman, who played sax, the band included Jonathan Finlayson on trumpet, sax player Maria Grand, Miles Okazaki on guitar, bassist Anthony Tidd, and drummer Sean Rickman. The ensemble burned bright on tunes like “Reflex,” and “Neutral Zone,” and Finlayson, in particular, is a young talent to watch. I remained at the Quad stage to catch vocalist Tierney Sutton, who was accompanied by Mark Summer on cello, and guitarist Serge Merlaud. 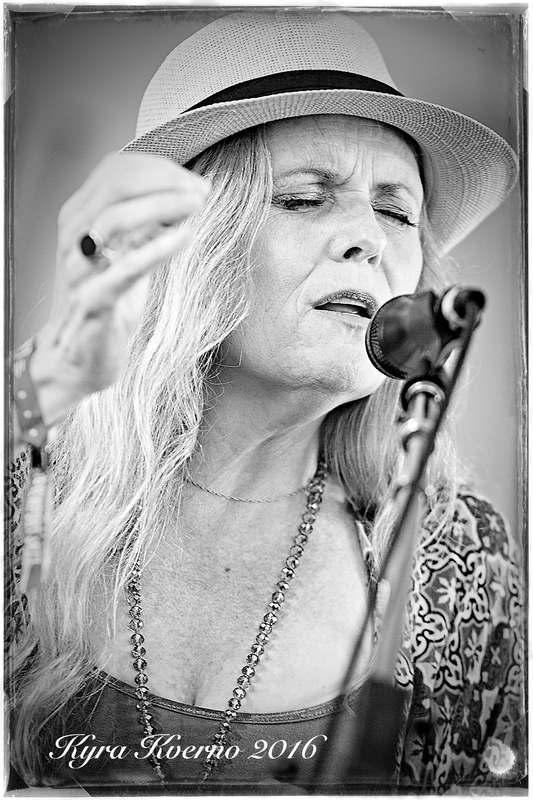 Sutton performed several numbers from her Joni Mitchell project, “After Blue.” They included “Little Green,” “All I Want,” a lovely juxtaposition of “April in Paris/Free Man in Paris,” and “Court and Spark.” All in all it was a fine tribute to Mitchell, performed with grace and sensitivity. Tierney Sutton. Photo by Kyra Kverno. Kamasi Washington was one of the biggest attractions of this year’s festival, and on Friday he played the first of two weekend sets on the main, or Fort, stage. It was immediately apparent that Washington attracted a diverse crowd that included everyone from college-age stoners to serious jazz aficionados, anxious to see what all the fuss is about. The sax player, who at times plays with the R&B rasp on Junior Walker, while at other times employing modal horn lines reminiscent of John Coltrane, did not let anyone down. Washington deployed a powerful band that was powered by drummers Tony Austin and Robert Miller, and included innovative bass player Miles Mosley, ethereal vocalist Patrice Quinn, the brilliant young pianist Jamael Dean, and Washington’s foil on trombone Ryan Porter. There was also a guest appearance from Washington’s father Ricky, a strong soloist on flute. Friday’s set featured songs from Washington’s milestone album, The Epic. Among them were the album’s opening track, the well-named “Changing of the Guard,” “Rerun Home,” and “Henrietta Our Hero,’ which featured a fine vocal performance from Quinn. The powerful set left everyone wishing for more, a wish that would be granted a couple of days later. Donny McCaslin Group. Photo by Kyra Kverno. The Donny McCaslin Group performed on the Quad stage and closed out the day for me, at least as far as Fort Adams was concerned. It’s fair to say that McCaslin is best known for playing on the last two David Bowie albums made before his death earlier this year. His group, which included Jason Linder on piano, Nate Wood on bass, and drummer Mark Giuliana, performed a set of challenging, but ultimately rewarding music that featured their version of “Warszawa,” a song written by Bowie and Brian Eno that appeared on Bowie’s Low album. “Beyond Now,” a song that was recorded for Bowie’s final album but not included, was given a sensitive treatment by McCaslin and company. But Friday was far from over because the festival’s first day features a nighttime concert at the International Tennis Hall of Fame in Newport. It’s a truly lovely setting for a concert with an audience that includes the well-dressed doyennes of Newport society alongside the shorts and t-shirts crowd that had spent a long day at the Fort. 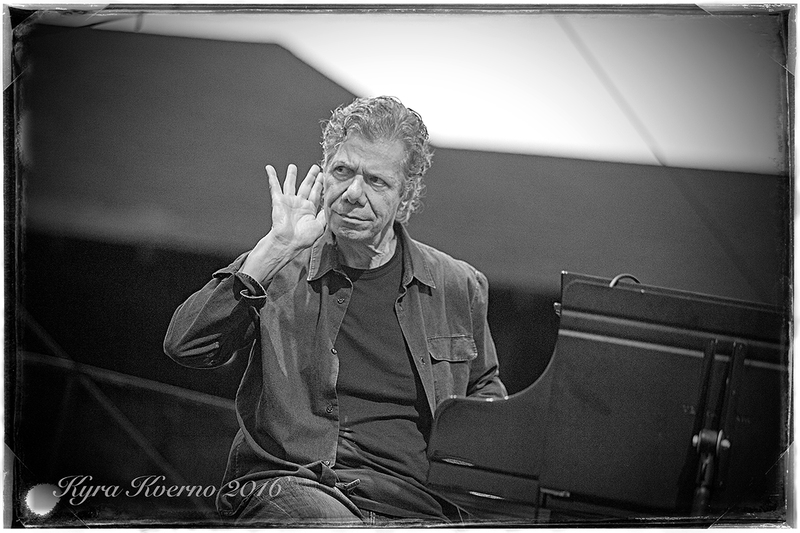 The evening’s entertainment featured Chick Corea, celebrating his 75th birthday, who was joined by drummer Brian Blade, and bass player Christian McBride, who this year was named Artistic Director of the Newport Jazz Festival. 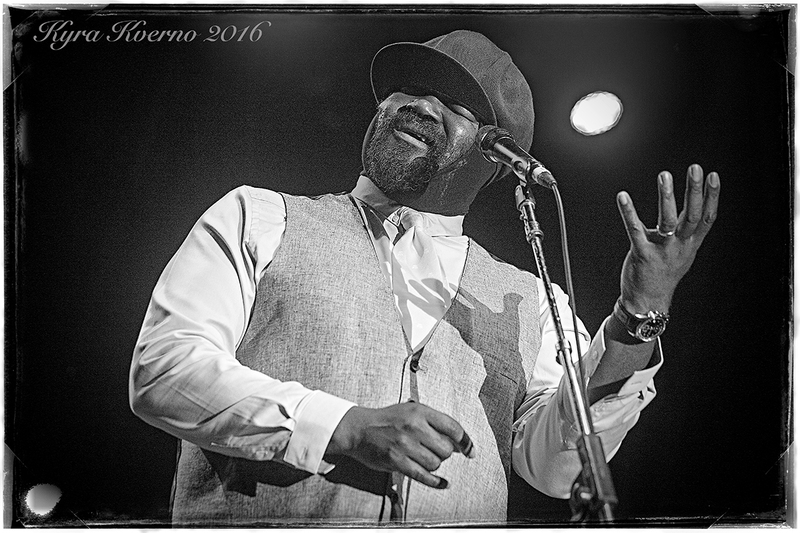 Gregory Porter. Photo by Kyra Kverno. Saturday began in the best way possible for me. I arrived at Fort Adams a little late because of a traffic jam resulting from the festival’s first sold-out day in many years, but I got there in time to see the brilliant guitarist Marc Ribot leading a hard-charging funk group called the Young Philadelphians through a delightful set that featured Philly Soul classics like “TSOP,” “Do It Any Way You Wanna,” and “Love TKO.” The group featured a three-piece string section, joined by a funky rhythm section led by the outstanding bassist Jamaaladeen Tacuma, and drummer Calvin Weston. At that point I was faced with a decision. I wanted to catch John Scofield and Joe Lovano playing on the Quad stage, but at about the same time the Bad Plus was performing Ornate Coleman’s landmark album Science Fiction on the Fort stage. I decided that seeing some of each set was better than missing one completely, so I began with the Scofield/Lovano set. Guitarist Scofield and sax player Lovano were joined by bassist Ben Street and drummer Bill Stewart for a first-rate set that included “Museum,” “Slinky,” and “Mr. Puffy” from Scofield’s 2015 album Past Present, as well as “Big Ben,” which appeared, appropriately, on Lovano’s Classic: Live at Newport album. I moved over to the Fort stage in time to catch the tail-end of the Bad Plus performance. The Coleman material is challenging, and as usual the Newport audience was appreciative, which encourages the musicians to take chances. I’ve always been impressed with the fact that the Newport Jazz Festival audience listens attentively, and rewards innovation with an appreciative response that lets the artists know that they can explore and create new and different things, and have an audience for them. The Bad Plus. Photo by Nikki Vee. In addition to the Coleman material, the Bad Plus offered up “Broken Shadows,” a new single scheduled for release later this month. One of my favorite performances of the weekend took place next on the Quad stage. Butler, Bernstein & the Hot 9 played a raucous set that was highlighted by a new arrangement of Duke Ellington’s “Diminuendo and Crescendo in Blue” that pianist Henry Butler had created especially for the occasion. Steve Bernstein. Photo by Nikki Vee. It was an audacious move given that Ellington’s performance of the piece, featuring sax player Paul Gonsalves’ 27 chorus solo, is perhaps the seminal moment in the history of the Newport Jazz Festival. But Butler and the group, led by Steve Bernstein on trumpet and flugelhorn, carried it off with great aplomb. Special mention should be made of the group’s scintillating horn section which included trombonist Clark Gayton, and Peter Apfelbaum and Erik Lawrence on saxophones. By the time Sunday roles around, the feet are tired, but the spirit is roused. 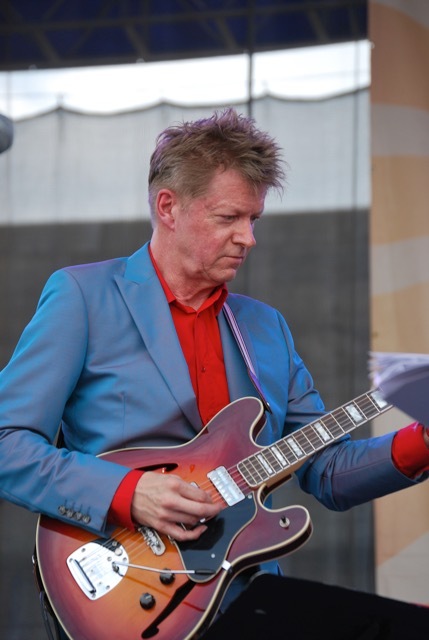 And what better way to begin the day than with a set by Nels Cline featuring the world-premiere of music from his new album Lovers? Cline is of course best-known as the innovative lead guitarist of the band Wilco, but he steps out regularly with solo recordings that often push the boundaries of modern music. Nels Cline. Photo by Nikki Vee. Lovers is a somewhat subdued effort, and probably the most accessible music that Cline has made as a solo artist. The fact that he chose to premiere this work at the Newport Jazz Festival speaks volumes about the respect that musicians have for the festival, and its founder George Wein. Cline was joined for the occasion by a 16-piece orchestra that included guitarist Julian Lage, and arranger, conductor Michael Leonhart, who also played trumpet. Leonhart’s arrangements stood out through the entire set, which featured Cline’s takes on Rodgers and Hammerstein’s “I Have Dreamed,” from “The King and I,” Gabor Szabo’s “Lady Gabor,” and “Secret Love,” a song made famous by Doris Day. Cline’s guitar playing, whether straight-ahead, or pounding on his effects boxes, was stellar throughout. Jose James. Photo by Nikki Vee. 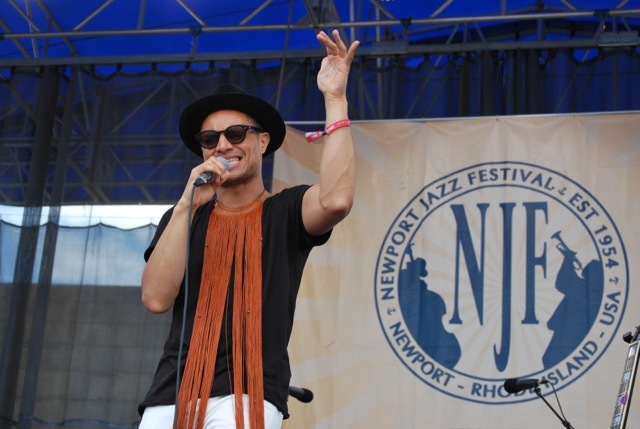 I saw Jose James for the first time at last year’s festival, and I was very happy when I heard that he was going to return this year. Graduating to the main stage, James moved the crowd with his powerful song “Let It Fall” before launching into his signature Bill Withers medley, which includes powerful takes on “Who is He (And What is He to You)?,” “Ain’t No Sunshine,” and “Grandma’s Hands,” among other Withers classics. Tribute was also paid to David Bowie with a fine take on “The Man Who Sold the World.” James is a talented and versatile performer with a very bright future indeed. 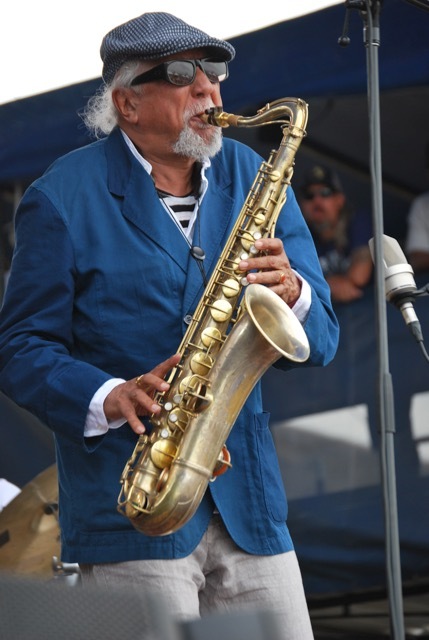 Charles Lloyd. Photo by Nikki Vee. 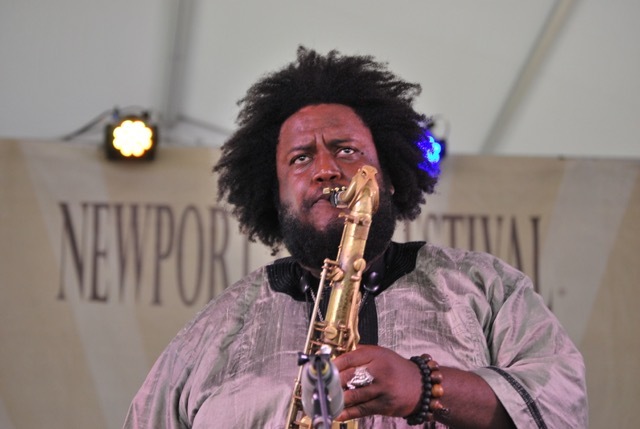 By that point on Sunday, I had the energy for one more set, and if I needed an energy infusion, I knew from Friday’s experience that I would get it from the second set of the weekend by Kamasi Washington. This time the group was playing on the smaller Quad stage, despite the fact that it was probably the most anticipated set of the day. A large crowd formed early, both within the tent, and along the outside. These were people who had been there on Friday and wanted more, or people that hadn’t and wanted to see what all the buzz was about. Kamasi Washington. Photo by Nikki Vee. Once again, Washington and crew did not disappoint. Unlike Gregory Porter’s second weekend set, it was very different from the Friday set. Songs from The Epic were still featured, but this time they included “Askim,” “Cherokee,” “Malcolm’s Theme,” and “Miss Understanding.” Kamasi Washington is clearly an artist who will not stand still, whether its from album to album, or just set to set. 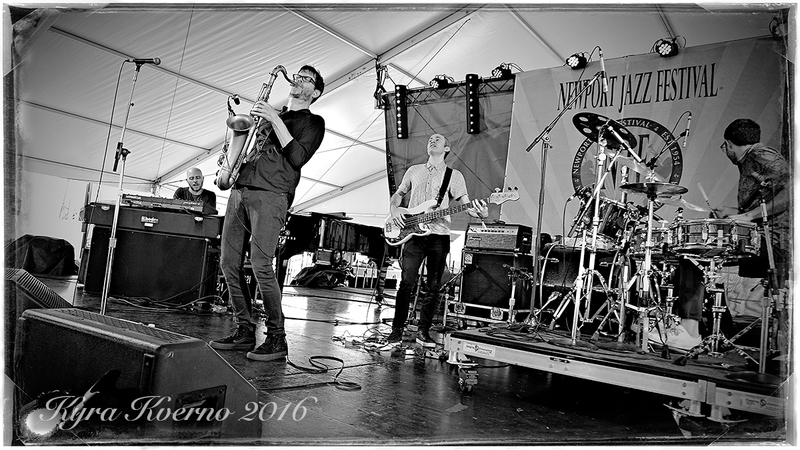 Sun-baked and foot-sore but exhilarated nonetheless, that concluded my Newport Jazz Festival experience for 2016. As I trudged wearily away from the festival grounds I was already thinking of 2017, when the festival will celebrate its 63rd anniversary as the longest running popular music festival in the world. And long may it run.